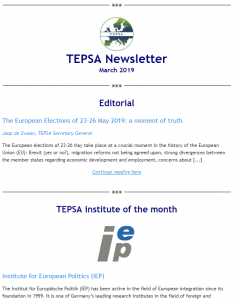 The TEPSA monthly Newsletter disseminates news, publications and events from TEPSA and the TEPSA member institutes to individuals involved in EU policy-making, think tanks, academia, civil society and anyone who signs up via the TEPSA website. The Newsletter and the TEPSA website are interlinked, so all information on the newsletter can also be found on our website. Since June 2017 the TEPSA Newsletter has adopted a new format, featuring a modern design to better reflect how the website is organised and allowing for a smoother reading experience. By filling out the form below, you agree that TEPSA will use the information you provide to share with you by email updates on the its activities.